Barnacle cover in the barnacle plots at Ecola fluctuated between about 60%-90%, and plots were dominated by the acorn barnacle, Balanus glandula. 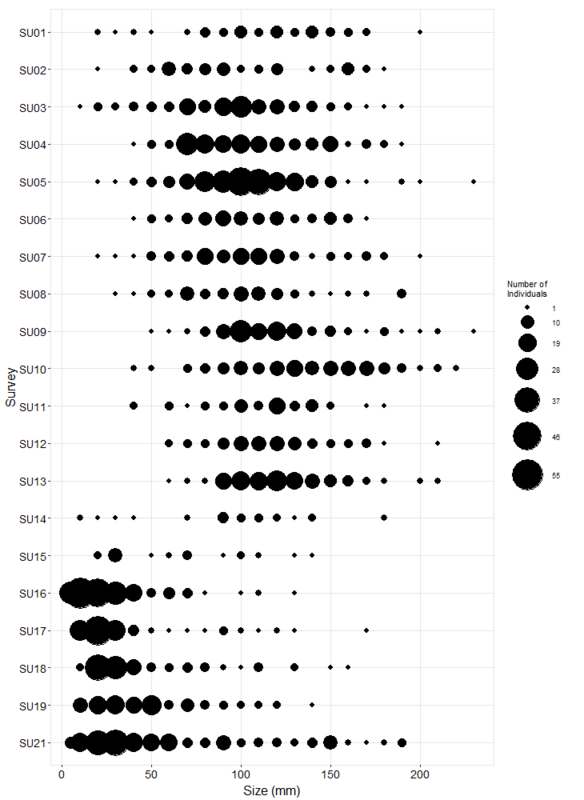 Mussel cover in Mytilus plots was quite high (around 90%) and stable from 2001-2008, but then experienced a decline in 2009, largely due to a near-complete loss of mussels in one plot, and a loss of about 50% of the mussels in a second plot. As of 2014, mussel cover had recovered to original levels. Pelvetiopsis cover in its target plots was relatively low (typically below 50%), and varied inversely with cover of barnacles. Plots targeting Neorhodomela experienced a gradual decline in cover of the red alga over time as Phyllospadix abundance increased in these plots. Limpets and littorines are the most common motile invertebrates in most plot types. Other key motile invertebrates include Nucella in mussel and Pelvetiopsis plots, and Tegula funebralis in Neorhodomela plots. Two transect types are present at Ecola, Saccharina (formerly Hedophyllum) and Phyllospadix. Hedophyllum was quite variable over time, with high cover between 2001-2004, followed by a near disappearance of the brown alga in 2005. 2006-2009 was a period of recovery, which in more recent years has been followed by a gradual decline. Cover of both surfgrass and the red alga, Mazzaella, has increased during periods of low Saccharina abundance. In the surfgrass transects, cover of Phyllospadix initially increased, but has been fairly stable since 2003. Ochre star counts fluctuated substantially over time, but as with several other Oregon sites, numbers were down in 2014, and we expect them to decline further in 2015 due to Sea Star Wasting Syndrome. Although a handful of small stars (<50 mm radius) were counted in most years, this site has not experienced any large recruitment events during the 13 years we have been monitoring it.